At the majority of excitatory synapses in the brain, the amino acid l-glutamate acts as the neurotransmitter that is released by calcium-dependent exocytosis from presynaptic nerve terminals. After diffusion across the synaptic cleft, molecules of l-glutamate bind to two families of neurotransmitter receptors in the postsynaptic membrane: the ligand-gated ion channels and G-protein-coupled receptors. The architecture of both families of glutamate-activated signaling proteins differs from that for other ligand-gated ion channels, on the one hand, and the majority of G-protein-coupled receptors, on the other. In both cases, a distinguishing feature of glutamate receptors is the structure that generates the agonist binding site. This domain shares homology with a large family of bacterial periplasmic binding proteins, a number of which have been crystallized. In these bacterial proteins, lig-ands bind in a cleft between two globular domains connected by beta strands. The binding of ligand stabilizes a closed cleft conformation in which the faces of each domain make contact with each other, while in the absence of ligand the domains assume an open clamshell-like conformation . In the case of glutamate receptors, which are thought to assemble as tetramers for the ion channel family and as dimers for the G-protein-coupled family, each subunit contains a complete copy of an agonist binding domain. Thus, there are four agonist binding sites per glutamate receptor ion channel and two agonist binding sites per G-protein receptor dimer. This understanding of the organization of the architecture of glutamate receptor channels emerged only recently and was brought into focus by the solution of crystal structures for the ligand binding domains of two ion channels and a G-protein-coupled glutamate receptor [2-6]. However, the picture is still far from complete, and the mechanisms that couple ligand binding to signal transduction have yet to be defined at atomic resolution. The domain organization of glutamate receptors is shown in Fig. 1. The simplest architecture is found in GluRO, a prokaryotic glutamate receptor ion channel from the photo-synthetic bacterium Synechocystis PCC 6803 . In this protein, the ligand binding core is formed by a protein with two globular domains that show structural homology to GlnBP, the glutamine binding protein from Escherichia coli . The key differences between GluRO and GlnBP are that in GluRO the amino acid sequence that generates the ion channel pore interrupts the S1 and S2 amino acid sequence that encodes the ligand binding domain. This is possible without disrupting the common fold found in GluRO and GlnBP because the ion channel emerges from the external surface of the second globular domain in GluRO, without occluding the ligand binding site, and thus can be removed by protein engineering for crystallographic studies. Eukaryotic glutamate receptor ion channels from the AMPA, kainate, and N-methyl-d-aspartate (NMDA) subtypes have a more complicated architecture with two differences from GluRO. First, not one but two bacterial periplasmic protein homology domains are present per subunit; second, the ion channel pore contains an additional transmembrane segment followed by a cytoplasmic domain of variable size. 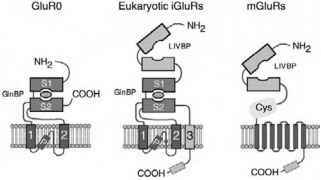 Figure 1 Domain organization of GluRO, a prokaryotic glutamate receptor ion channel, eukaryotic glutamate receptor ion channels (iGluRs), and G-protein-coupled glutamate receptors (mGluRs). The ligand binding domains are shaded to indicate structural homology with two families of bacterial periplasmic binding proteins, glutamine binding protein (GlnBP), and leucine/isoleucine/valine binding protein (LIVBP). The membrane domains of ion channels contain two transmembrane segments (1 and 2) and pore helix (P), combined with a third transmembrane segment for eukaryotic iGluRs; the pore interrupts the GlnBP-homology-domain-creating segments S1 and S2. mGluRs contain a cysteine-rich domain (Cys) that couples the ligand binding core to a seven-segment transmembrane region and intracellular domain. Starting from the amino terminus, the initial 400 amino acids in eukaryotic glutamate receptor ion channels share weak sequence homology with leucine/isoleucine/valine binding protein (LIVBP). In glutamate receptor ion channels the function of this domain is poorly characterized. The results of functional and biochemical studies show that this region, which is often called the amino terminal domain, plays a major role in subunit assembly [8,9] but does not bind l-glutamate (or in the case of NMDA receptor NR1 subunits glycine) and instead is the site of action of some allosteric modulators [10-12]. Following the amino terminal domain the S1 and S2 agonist binding segments (interrupted by the core of the ion channel pore, similar to the arrangement in GluR0) form the agonist binding domain, as revealed in the structure of the AMPA receptor GluR2 subunit [2,3]. A third transmembrane segment that forms part of the ion channel occurs after segment S2 and precedes the cytoplasmic C-terminal domain. G-protein-coupled glutamate receptors, typified by mGluR1, are also multidomain structures in which each subunit contains a single glutamate binding site that shows structural homology to LIVBP [4,6]. The ligand binding core in G-protein-coupled receptors is followed by a cysteine-rich region, a seven-segment transmembrane region, and a 250-residue intracellular domain. The two subunits are linked together by a disulfide bond between the ligand binding domains. Despite the fact that l-glutamate is the naturally occurring ligand that activates ion channel and G-protein-coupled glutamate receptors, crystal structures of the ligand binding cores of these proteins reveal distinct mechanisms for the coordination of ligands. In all glutamate receptors, the lig-and binds at the interface between the two globular domains that make up an individual subunit. The ligand makes contact with amino acids in domains 1 and 2, but the chemistry of the binding surface differs substantially in individual proteins. This allows the binding of conformationally restricted ligands such as AMPA with exquisite subtype selectivity. The ligand binding cores of GluR0 and GluR2 share a fold similar to glutamine binding protein but have markedly different substrate binding preferences, while the fold of the G-protein-coupled receptor mGluR1 more closely resembles LIVBP. However, in GluR0 and mGluR1 l-glutamate binds in an extended conformation in which the y-carboxyl group interacts with domain 1, while in GluR2 the torsion angle of the ligand side chain undergoes a 105° rotation, positioning the y-carboxyl group for interaction with domain 2. The high-resolution structures obtained for GluR0 and GluR2 reveal that in addition to protein-ligand interactions there are multiple solvent-mediated interactions of the glutamate y-carboxyl group with the ligand binding core. It is believed that l-glutamate first binds to domain 1 and that subsequent domain closure buries the ligand and permits interactions of the alpha and gamma functional groups with domains 1 and 2, stabilizing the ligand-bound, closed-cleft conformation. How is ligand binding translated into a signal that causes ion channel gating or G-protein signaling? Crystal structures of all three proteins and equilibrium ultracentrifugation experiments for the ligand binding domains of GluR0 and GluR2 reveal the formation of dimers [3-6,13]. While this was to be expected for mGluR1, due to the presence of an inter-subunit disulfide bond, the presence of dimers for GluR0 and GluR2 was a novel finding. In mGluR1, the cysteine residues responsible for dimerization lie in a disordered segment that probably functions to increase the membrane concentration of the dimeric species. Strikingly, for all three proteins the dimer interface is formed exclusively by domain 1 and suggests mechanisms by which ligand binding mediates signal transduction. For GluR2, comparison of the crystal structures of the glutamate-bound and ligand-free forms does not reveal any rearrangement of the dimer interface produced by the binding of ligand . Instead, the distance between the domain 2 surfaces from which the ion channel emerges increases in the ligand-bound, closed-cleft conformation. It is thus plausible that agonist-stabilized domain closure causes the linkers leading to the ion channel transmembrane helices to move farther apart and that this forces the ion channel to open (Fig. 2). A role for the dimer interface in the process of desensiti-zation, which proceeds on a millisecond time scale for glutamate receptor ion channels, also emerges from these structural studies. 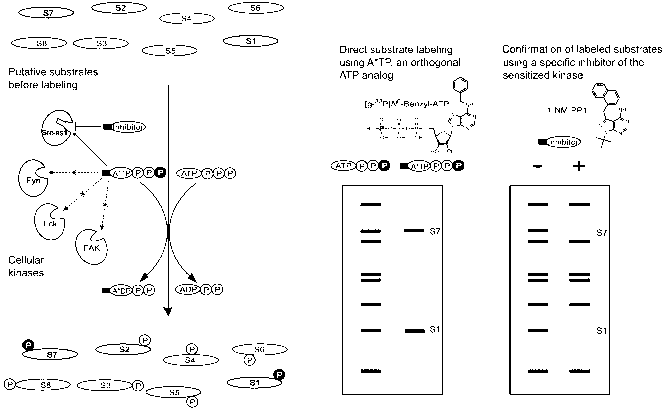 Experiments with the AMPA receptor GluR2 subunit revealed that stabilization of the intradimer interface by either mutations at the dimer interface or allosteric modulators that bind to the dimer interface and glue the two subunits together reduces desensitization. On the other hand, perturbations that destabilize the interface enhance desensitization. 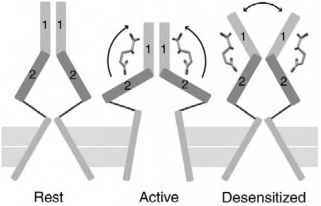 Desensitization almost certainly occurs via rearrangement of the dimer interface, which disengages the agonist-induced conformational change in the ligand-binding core from the ion channel gate. Figure 2 A structural model for iGluR activation and desensitization based on crystallographic and biochemical studies that reveal assembly of the ligand binding cores as dimers via domain 1 surfaces. At rest, the ligand binding domains assume an open conformation and the channel is closed. During activation, the ligand binding cores contract, exerting tension on the ion channel segments and causing the channel to open. During desensitization, the ligand binding cores remain contracted, but movement about the domain 1 dimer interface allows the channel to enter a nonconducting state. In contrast to the above picture, the binding of agonist for mGluRl is associated with large changes in the relative orientation of the ligand binding domains which results from a 70° rotation around the dimer interface. This causes the separation between the pair of domain 2 surfaces that leads to the transmembrane segment to decrease in the agonist-bound form, presumably leading to a conformational change that activates G-protein signaling. The different behavior of the dimer interface in response to the binding of agonist in the ion channel and G-protein-coupled glutamate receptors is striking but does not imply that rotations around the dimer interface are absent in the ion channel proteins. Likewise, there may well be additional conformational states available to G-protein-coupled glutamate receptors that do not involve rotations around the dimer interface and which have not yet been crystallized. These structures mark a tremendous advance in our understanding of how glutamate receptors function, but much experimental work remains to be done. There are additional domains and subtypes to crystallize, as well as the full length proteins. There is also the pressing issue of the nature of the conformational states that correspond to the different functional states identified in functional studies. 1. Quiocho, F.A. and Ledvina, P. S. (1996). Atomic structure and specificity of bacterial periplasmic receptors for active transport and chemotaxis: variation of common themes. Mol. Microbiol. 20, 17-25. 2. Armstrong, N., Sun, Y., Chen, G. Q., and Gouaux, E. (1998). Structure of a glutamate-receptor ligand-binding core in complex with kainate. Nature 395, 913-917. 3. Armstrong, N. and Gouaux, E. (2000). Mechanisms for activation and antagonism of an AMPA-sensitive glutamate receptor: crystal structures of the GluR2 ligand binding core. Neuron 28, 165-181. 4. Kunishima, N., Shimada, Y., Tsuji, Y., Sato, T., Yamamoto, M., Kumasaka, T., Nakanishi, S., Jingami, H., and Morikawa, K. (2000). Structural basis of glutamate recognition by a dimeric metabotropic glutamate receptor. Nature 407, 971-977. 5. Mayer, M. L., Olson, R., and Gouaux, E. (2001). Mechanisms for ligand binding to GluR0 ion channels: crystal structures of the glutamate and serine complexes and a closed apo state. J. Mol. Biol. 311, 815-836. 6. Tsuchiya, D., Kunishima, N., Kamiya, N., Jingami, H., and Morikawa, K. (2002). Structural views of the ligand-binding cores of a metabotropic glutamate receptor complexed with an antagonist and both glutamate and Gd3+. Proc. Natl. Acad. Sci. USA 99, 2660-2665. 7. Chen, G. Q., Cui, C., Mayer, M. L., and Gouaux, E. (1999). Functional characterization of a potassium-selective prokaryotic glutamate receptor. Nature 402, 817-821. 8. Kuusinen, A., Abele, R., Madden, D.R., and Keinanen, K. (1999). Oligomerization and ligand-binding properties of the ectodomain of the alpha-amino-3-hydroxy-5-methyl-4-isoxazole propionic acid receptor subunit GluRD. J. Biol. Chem. 274, 28937-28943. 9. Ayalon, G. and Stern-Bach, Y., (2001). Functional assembly of AMPA and kainate receptors is mediated by several discrete protein-protein interactions. Neuron. 31, 103-113. 10. Masuko, T., Kashiwagi, K., Kuno, T., Nguyen, N.D., Pahk, A.J., Fukuchi, J., Igarashi, K., and Williams, K. (1999). A regulatory domain (R1-R2) in the amino terminus of the N-methyl-D-aspartate receptor: effects of spermine, protons, and ifenprodil, and structural similarity to bacterial leucine/isoleucine/valine binding protein. Mol. Pharmacol. 55, 957-969. 11. Paoletti, P., Perin-Dureau, F., Fayyazuddin, A., Le Goff, A., Callebaut, I., and Neyton, J. (2000). Molecular organization of a zinc binding N-terminal modulatory domain in a NMDA receptor subunit. Neuron 28, 911-925. 12. 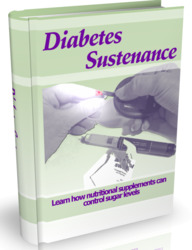 Perin-Dureau, F., Rachline, J., Neyton, J., and Paoletti, P. (2002). Mapping the binding site of the neuroprotectant ifenprodil on NMDA receptors. J. Neurosci. 22, 5955-5965. 13. Sun, Y., Olson, R., Horning, M., Armstrong, N., Mayer, M., and Gouaux, E. (2002). Mechanism of glutamate receptor desensitization. Nature 417, 245-253.